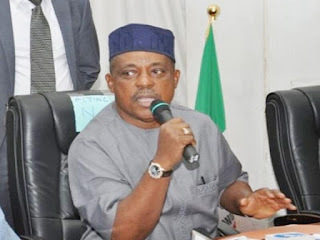 The national chairman of the main opposition party, Peoples Democratic Party, PDP, Prince Uche Secondus says Nigeria under the watch of the ruling All Progressives Congress, APC, has collapsed. Secondus said this while speaking in Aba, Abia State, Wednesday, when the party’s presidential candidate, Alhaji Atiku Abubakar and his vice, Mr. Peter Obi held an interactive session with the South East business community. “Buhari is not in charge. He is not worried about what Nigerians are suffering. He is passing the bulk. Atiku will not pass the bulk; he will take full responsibility of the economy and the country. “We must weep for our country. In the last three years, we are lagging behind in virtually every sector.